What Is PMI? How to Do It? PMI (Positive Material Identification) testing is the analysis of materials to determine the chemical composition of a metal or alloy at particular (usually multiple) steps of alloy manufacturing or in-process alloy installation. Knowing the exact composition and grade of an alloy enables suppliers, plant workers, and other responsible parties in the chain of custody of components to match alloy specifications that are chosen for their specific properties such as heat resistance, corrosion resistance, durability, etc. Having the right alloy in the right place is essential in places like petroleum refineries and chemical plants, because the right alloy with the right properties is often all that stands between a safe, efficient operation and lost time and revenue. 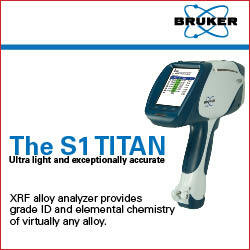 Contact Bruker to discuss how the Bruker S1 TITAN can help you with your PMI testing needs! Stainless steel grades differ by chemical composition. The key differences between the various grades are mainly the amount of Fe (iron), Cr (chromium), Ni (nickel), Mo (molybdenum), and Cu (copper). Some grades are very different from each other and have different properties; for example, 400 series stainless steels are magnetic while 300 series stainless steels are not. Other grades are more similar with very similar properties, and it is much harder to tell the difference between them without the aid of technology. For example, 304SS has 18-20% Cr and 8-10.5% Ni, whereas 316SS has 16-18% Cr and 10-14% Ni. Although these alloys are very close in composition, they respond differently to corrosive chemicals and higher temperatures making it necessary to be certain you are using the correct alloy for the job intended. Currently most alloy manufacturers, petroleum refineries, and other businesses responsible for alloy grade verification use technology to quickly and easily separate various grades of stainless steel. The most common, portable, and easy-to-use tool for this purpose is a handheld XRF (x-ray fluorescence) analyzer. These instruments are highly accurate at determining the chemical composition of alloys, and thereby their grade. Moreover, they do so within a matter of 5 seconds or less for most stainless steel grades, without significant sample preparation, and safely. They pay for themselves in terms of reducing materials mix-ups and getting the best price for scrap identification, and they do not require any advanced training to operate. An operator can be trained to use one within a few hours. The need for PMI testing in the Oil and Gas and Refining Industries came to light as early as 1992 when OSHA determined it was necessary to enforce PSM or Process Safety Management of Highly Hazardous Chemicals (HHC)to help avoid accidents, injuries and death. Recognizing the need for guidance for increased safety against these HHC releases, OSHA created an instructional document in 2007 describing specific protocol for implementing a National Emphasis Program (NEP) in the hopes of reducing or eliminating these types of hazards in the work place at petroleum refineries and other chemical processing plants. Due to the inherent danger in analyzing materials that are in process, it is necessary to use instrumentation that is non-destructive. This testing qualifies the analysis as non-destructive testing, or NDT. Non-destructive testing (NDT) indicates that the material is not altered in any way and is essentially in the exact same condition it was prior to testing with no visible marks or structural damage left from the analysis. 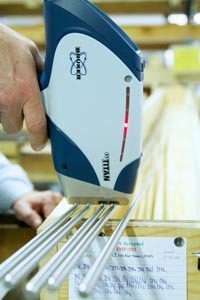 The instrument of choice for non-destructive testing where carbon levels are not needed for evaluation is handheld XRF. Contact Bruker to find out how your PMI needs can be met with the Bruker PMI Handheld XRF gun! Mixing up material, stamping the wrong grade, losing the paperwork or having the wrong paperwork are all scenarios that have happened and continue to happen in the metals industry. It´s never done on purpose, but there are circumstances that cause these issues making it necessary for PMI to be performed at multiple stages of delivery and use. In process piping, for example, 41% of the largest losses in the hydrocarbon processing industry are a direct result of failures in piping systems. One of the first-pass, most effective ways to prevent such failures is to conduct PMI to insure that specs are met where corrosion-resistant alloys are necessary, since corrosion is one of the leading causes of piping failures. A handheld XRF PMI gun can analyze, identify and display grade and composition of a material in less than 5 seconds without creating any marks on the material or destroying the sample in any way. Because a materials mix-up can happen at any stage of the process from the alloy fabricator to installation of a part at the refinery, each petroleum refinery, chemical plant, petrochemical plant etc. should develop a material verification program to minimize this risk. It is important to check every alloy and component multiple times during every stage; this is known as a 100% PMI protocol. The material verification program/PMI process should begin at the incoming materials warehouse, where product may be tested via a PMI spot check method as part of the receiving process. As well as PMI testing, a material verification program should provide complete and accurate documentation indicating which materials have been tested and what the results were. Some plant and refinery operators have historically relied on certificates of composition or material test reports from suppliers; unfortunately, audits and experience have shown these methods to be less that 100% reliable. Aside from reports that are simply inaccurate, there are also instances in which certificates of composition or certificates of analysis get paired with the wrong material or simply get separated from the materials to which they correspond. PMI should then be performed once again prior to installation of new components, piping, etc. For maximal efficiency and safety, a 100% PMI program (API 578)should be in place to ensure that every part installed in an environment that is high-heat, corrosive, high-pressure, etc. meets the spec required to stand up to the demands of the environment. Previous experience of knowledge of information pertaining to inadvertent material substitutions or mix-ups at the site in question. Certificates of Compliance, Mill Test Reports or Material Certifications should not be relied upon as a substitute for PMI testing, but they are an important part of an overall quality assurance program. Those individuals performing PMI testing should obtain and follow the PMI test procedure approved by the owner/user. This procedure should cover the techniques used, equipment calibration procedures, the qualification requirements of the PMI test personnel, the testing methodology, and documentations requirements. When documentation, such as drawings, isused in lieu of a physical marking, the documentation should allow the owner/user to identify which components were tested. When PMI testing is conducted on new or existing piping systems, records of the results should be kept as long as the piping system exists in its original location. If a piping system or a portion of a piping system that has not received material verification is relocated, the owner/user should consider the need for PMI testing prior to placing the relocated components into service. XRF is x-ray fluorescence. Fluorescence means that some energy is produced, is incident upon an object, and then another lower energy is emitted from that object. In the case of x-ray fluorescence, the original energy is produced in the x-ray tube of an XRF instrument. This original energy is an x-ray beam with enough energy to cause electrons to be knocked out of their orbits in the atoms in your stainless steel analysis sample; this is called the primary x-ray beam. The stainless steel sample is the object upon which the primary x-ray beam is incident, and the object then emits another energy that is lower than the energy of the primary x-ray beam. The energy emitted from the sample is a result of an electron losing energy when it moves from a higher orbit to a lower orbit in the atoms in your sample. The electrons change orbits because the energy of the primary x-ray beam is strong enough to knock electrons out of the innermost orbital shells of the atoms in your sample. When electrons are knocked out of the orbits, this creates a vacancy where the electron used to be. Since these vacancies make the atom unstable, they must immediately be filled with other electrons. The atom can fill these vacancies using electrons from higher orbits, so an electron from an orbital shell further out from the nucleus can move down to fill a vacancy in an orbital shell closer to the nucleus. When this happens, the electron loses some energy; this energy is the fluorescent energy and it is detected by the detector in the XRF instrument. Since each element has a unique set of fluorescent energies, the instrument can determine what elements are present in the sample, as well as how much. The instrument now knows the elemental composition of your stainless steel sample, and it can reference this composition against an on-board library of known alloy grade compositions and tell you what grade of stainless steel you have. For example, if the result shows 17% Cr, 12% Ni, and 2% Mo, this is 316 SS, and the XRF alloy tested will identify it as such. If you work in an alloy testing lab where alloy grade verification is your job, you probably use some form of XRF alloy tester or analyser for PMI. These instruments come in bench-top and handheld form, and while many of them can be operated by a novice user, it takes an expert to assure that data is being reported properly, that instruments are well-maintained, calibrated, and tested, and that any drift in results in monitored and controlled for. This is especially true for large bench-top instruments. Verify that your instrument is giving repeatable results under different conditions. For example, if your lab is 60 degrees in the winter but 90 degrees in summer, you may want to verify that this does not affect analysis results. Observe data over time in order to observe trends. For example, is there an upward or downward trend in your data, even though the results remain in range? If you notice this trend, you can work to identify and resolve the problem early, instead of waiting until the data goes out of range. If you wait that long, you will have a situation in which the instrument will be offline at a potentially inconvenient time, causing loss of profit and efficiency. Another important consideration is that your check sample should contain the elements of interest of your actual sample. This means that if your XRF´s main purpose is to test whether Ti-based alloys are in spec, don´t use a stainless steel reference sample for your calibration verification. By using a standard that is of the same composition of your intended test material, you can greatly reduce uncertainty that your instrument is reading accurately and reliably as you can constantly verify each element is analyzing within spec for your specific material. Given the critical mishaps that can happen and the time, money and efficiency benefits, PMI testing is the answer to not only providing a safe environment for plant workers but also for ensuring projects are completed effectively with no down time. Still have questions about PMI testing? Contact Bruker for answers to your PMI testing needs!